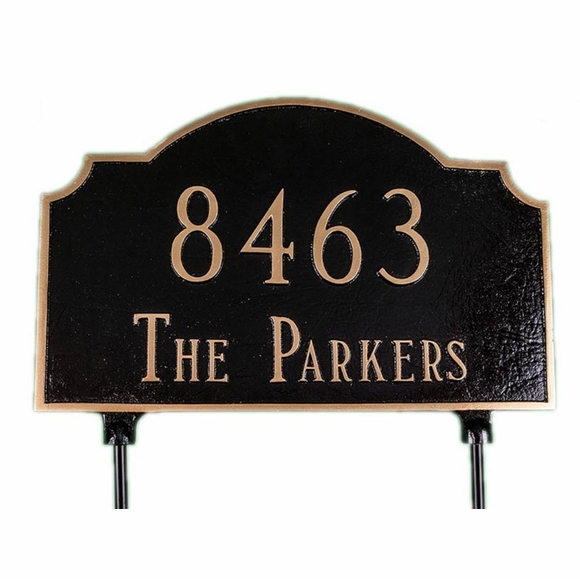 Vanderbilt 2 Sided Personalized Lawn Address Sign - - comes complete with two 17" lawn stakes. Made in USA. Line 2 (optional) holds up to 17 characters (including spaces) to identify your street, family, town, or business name. NOTE: If your sign is a 1-line sign, please leave the Line 2 input box empty. Holds up to five 3" characters on line 1 and up to 17 characters on line 2. If you are using line 1 only, then the vanderbilt will hold up to five 4" characters. Be sure to type your text exactly as you want it to appear. Great product! We got the white lettering/black background sign. Very visible, without being obnoxious. It was easy to assemble, and is a classy addition to our yard! Absolutely perfect sign to place at the top of my driveway. The house numbers are big and easily visible on this sign. Great quality.